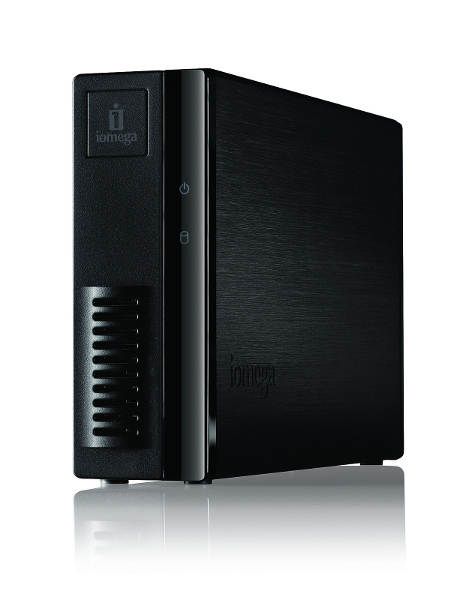 Get high-capacity, reliable home network storage with the Lenovo® Iomega® EZ Media & Backup Center. Easily share and access files, photos, videos, and music between all your computers and with friends and family. It's powerful and fast, plus the three-step set-up is very simple, even if you've never used a network drive before. This feature-rich drive has a built in UPnP™ AV Media Server (DLNA certified) and iTunes™ Server so content can easily be shared between computers and any other digital media adapters such as game consoles, digital picture frames or networked TVs. Plus, automatically post files to your Facebook®, YouTube® and Flickr™ accounts. - Easily share content with friends and family outside of your home using the the LenovoEMC™ Personal Cloud feature. Invited guests will have access to read and write to files and folders on your network drive. No need to email file attachments. - File distribution made easy. Drop files into a designated distribution folder, and all of those on the distribution list automatically get an email with either the file itself or a link to download the file(s). - Whole home media aggregation: Easily consolidate all the media files on all your home computers to a single location and stream content to your media devices with Twonky Media. - Access files from any web browser via LenovoEMC Personal Cloud. - Stream media to your iPhone®, iPad®, Android™ and other mobile devices while on the road. - Upload and share files and folders directly from iPhone®, iPad®, Android™ and other mobile devices. - Time Machine® Support: allows Apple® users to easily backup any Mac computers running OS X (10.5 or later) using Time Machine. - Personal Cloud Backup: Copy data between personal cloud member systems and the EZ Media & Backup Center. - Public Cloud Backup: Use one of the integrated third party cloud-based storage services such as Amazon S3, or MozyConnect™ Beta to replicate data from your EZ Media & Backup Center to your public cloud account. - Cloud Disaster Recovery: Utilize two or more EZ Media & Backup Center Drives in different locations and the LenovoEMC Personal Cloud function to create your own disaster recovery scheme. - Define your Copy Job to copy/synchronize files to and from connected drives and/or any other shared storage on your network. - Schedule jobs to run on a predetermined schedule. Social Media Sharing Made Easy: Convenient folders that automatically integrate with your social media accounts. Multiple accounts are no problem – just create another folder for each account. - Facebook: Files dropped into your Facebook folder are automatically uploaded to your Facebook page. - Flickr: Files dropped into your Flickr folder are automatically added to the designated Flickr photo album. - YouTube: Videos dropped into your YouTube folder are automatically uploaded to your YouTube channel. - Picture Transfer Protocol (PTP): No touch, automatic transfer of photos from digital cameras via the USB port. - Photo resize: Automatically resize photos any lower resolution. - Watermark: Automatically add a watermark of your choosing to photos as they are re-sized. - Reporting: Email alerts provide up-to-the-minute updates on the status of your device even when you are away from your computer. - Expandability: Add storage capacity by connecting external USB Hard Disk Drives. Supports NTFS, HFS+, FAT32, and ext3 formatted hard drives..
- Native security support with robust username and password authorized access. Create additional users and secure their content with password protection. - User Quotas: easily manage capacity by setting maximum limits per user. - Power Efficient: Runs cool and quiet with a fan-less design. Supported drive spin down to conserve more energy when the drive is idle. (user adjustable). The LenovoEMC™ Personal Cloud is the revolutionary technology that allows you to protect and share your data. LenovoEMC Personal Cloud is a web-based computing architecture that connects your Lenovo® Iomega® EZ Media & Backup Center to other individuals and/or devices via the Internet. Unlike public and private cloud applications, LenovoEMC’s Personal Cloud technology is completely self-owned – so the content and accessibility is always under your control. - Synchronization: Users around the globe can sync files directly between computers as though they were on a local network. - Collaboration: Easily set up a shared workspace so that local and remote users can view and edit documents (spreadsheets, presentations, and word processing documents, for example) -especially useful for helping geographically dispersed workers collaborate. - Sharing: Sending large files can quickly choke your company's e-mail system. And e-mailing sensitive files can raise security concerns. LenovoEMC Personal Cloud offers functionality that makes it easy to securely copy and transfer large or confidential files. - Security: LenovoEMC Personal Cloud allows you to choose who has access to what data by invitation only. And, users can choose from three levels of security when sending data over a public network. - Backup: Keeping a second copy of your most valuable data (family pictures, insurance and financial data, for example) in an offsite location ensures it is safe in the event of an unforeseen disaster. Using your EZ Media & Backup Center and another LenovoEMC Personal Cloud device, you can set up scheduled copy jobs to duplicate data in another site. Jobs run in the background and can be scheduled after hours so your data is being protected while you sleep.